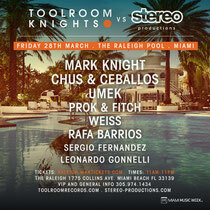 This year’s Miami WMC gets set for Mark Knight’s Toolroom Knights as it goes head to head with Chus & Ceballos’ Stereo Productions at the Raleigh on Collins Avenue. The Raleigh Pool is an opulent and stunning place and should be a great setting for these two top dance music brands. Heading up the proceedings, Grammy award nominee Mark Knight will tease the crowd with Toolroom classics and upfront cuts; whilst Chus & Ceballos will be bringing their trademark ‘Iberican Sound’ to the pool party. With a line-up featuring UMEK, Prok & Fitch and Weiss, alongside Rafa Barrios, Sergio Fernandez and Leonardo Gonnelli, this has all the ingredients to be a top party.Stylistically the event promises to cover a broad spectrum of dance music encompassing deep, future house hits and underground tech tracks, all set to some of the most spectacular scenery on South Beach. Tickets are on sale now.